Want to predict what kind of weather you will have this Halloween? Have students complete this free math activity! The activity is one of 8 Choice Board activities in a larger packet that focuses on collecting and interpreting data. The Halloween Weather activity asks students to collect temperature data from 3 cities, compare the high and low temperatures, and present their findings in graph form. In addition, students make predictions based on their samples. This activity is part of Choice Board Math Activities for Halloween, a 61-page packet that includes 8 activities, notes to the teacher, and a Choice Board Evaluation Rubric. 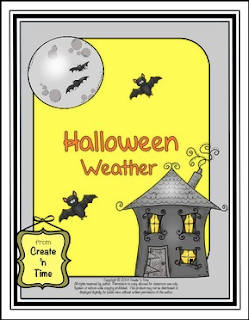 All activities are based on Halloween scenarios and complete handouts are included. See the Create ‘n Time store for details. Designed for middle school grades 4-8.